Do you think that dog poop is a 'good every once in a while' food? I have tried the Benchmark, it's damn good for that cheap. Still, I have a hard time not springing for the full Buffalo Trace for $20. My assessment exactly. I mainly use the Benchmark for mixing Manhattans. I'm glad you liked it. You people and your alcoholic enabling!! Thanks in no small part to Hedge and Demi, I picked up a bottle of Jameson and enjoyed a larger amount than I originally intended to. That, my friends, is peer pressure in action. I fully intend to partake in our next game day with glass in hand. In fact, I am here at work already halfway through my next bottle. This ... may not have gone exactly as I planned. First thought: "Man I am jealous of Sephirotic's job." Second thought: "God I hope he's not an airline pilot." No, but he is responsible for the future of video games. Wait - was the bottle fresh this morning? That's the real question. Now it is my turn to be jealous. The only liquor store I know in Howard County that carries it charges $24.95/750ml. I can get it for $19.95/750ml, but I have to drive into the ghetto to get it. I might have to stock up the next time I go down to Tampa. The only store I've found near me carries it for $28/750ml. Stopped by the local Froogal's on the way back from my haircut to re-stock on a few things. Picked up a few fifths, but two pertinent to this thread: Buffalo Trace and Baker's. Yum. EDIT: I hadn't looked before, but living next to KY has its advantages. Our local Froogal's carries Jefferson Reserve. Anyone know of a store with a good variety of scotches in San Fran? My state has a sparse selection that's picked for us by our ABC board, so I usually use travel opportunities to pick up a bottle I can't find at my local store. In a couple of weeks I'll be at WWDC at the Moscone Center and staying near Union Square Park, so close to that would be ideal, but I don't mind hopping on the BART for some adventure. I bought a bottle of Bulleit on Saturday, along with a bottle of Baileys. Come Sunday morning, the Baileys was empty, and the Bulleit was still unopened. Where do I turn my man-card in again? I have a bottle of dalwhinnie in the cupboard. Trying to wait for next weekend. It's SFW if that's what you're asking. K&L Wines (638 4th Street at Bluxome) is my goto store as it's at the end of the block from my work. Not the largest selection but what they have is good and their prices are reasonable. Two other stores I recommend are D & M Wine & Liquor Co (2200 Fillmore at Sacramento) and Blackwell’s Wines & Spirits (5620 Geary, between 20th and 21st). Both of these are far from from downtown but easily accesible by bus or cab. edit: Totally forgot to add in Cask (17 3rd Street) which is right between Moscone and your hotel. I haven't been there but I've heard good things. As for scotch, I don't know if I've posted in this thread, yet, but I echo the sentiment that Laphroaig is a terrible place to start. It's a terrible thing to have in your mouth at all. It seriously tastes like Chloraseptic Spray. A good beginner scotch for the the price is always Dewar's White Label. A lot of snobbier scotchies turn their nose at it because it's a blended scotch, but it's smooth and sweet and $25 a dollar. That's where I started and it'll always do in a pinch. I can go through a bottle of Glenfiddich 12year in 2 weeks. The difference between Glenfiddich and Dewars is like the difference between premium and regular unleaded gasoline. They are very similar, yet oh so very different. I bought a bottle of Glenfiddich 15year once and will never do that again. Too much of a smoky flavor for me. I like smoother drinks with more citrus or floral tastes. The 15 year Glenfiddich was like drinking Memphis brisket. Some people love it, but too woodsy and smoky for me. I've had a sampler bottle of Glenfiddich 18year that the store clerk gave me and absolutely loved it. It's pretty much everything I want in a scotch. Unfortunately, at $80 a bottle, its not something I can get all the time. It will definitely be my next bottle, though. I've had a couple glasses out of a bottle of Glenlivet that I bought for an old brother-in-law and didn't really like that either. That was a long time ago, though and would like to try it again. It was rougher on the back-end than the smooth finish I was used to with Dewar's so I choked it down. Like I said, though, that was a while ago. I have about two glasses worth of a bottle of Glenmorangie Astar that I bought for myself for my birthday 2 years ago. That should tell you something right there. It is like liquid fire and must, must be drank on the rocks or with a hefty splash of water. Some people do this to "open up" the flavor of a whisky or scotch, but in this instance it is purely to make it drinkable. It is rough and hot. It's 125proof, so it doesn't play nice with the inexperienced. I cannot recommend this bottle, especially with the $80 price tag. Macallan 12year is my favorite scotch, by far. It has a good taste and a lot of flavor, but is still smooth enough to be an everyday drinker. It's about $50 a bottle, but it is worth every single penny. The taste is that far ahead of its peers. Of course, this is only my opinion. I like a smooth scotch without a lot of bite, though, and that sounds what you guys are looking for. If you put the money down you will not be disappointed. And here is the reason I popped into this thread. To brag that my boss gave me the rest of one of his bottles as a severance package for our shop closing down. 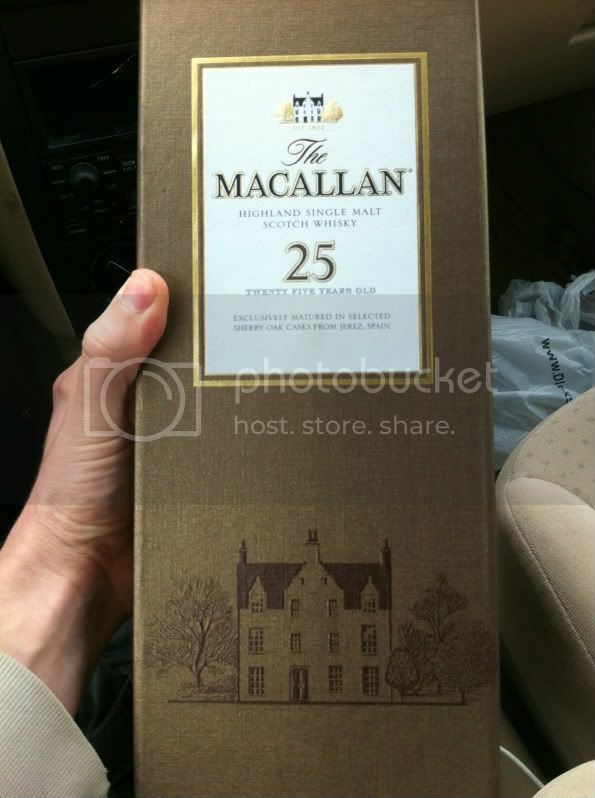 It's a little less than half a bottle of Macallan 25 year old! I haven't tried it, yet, but am super excited to. I'm waiting for a couple of buddies to try it with me. The best things must be shared. I know it's probably the only time I'll get to have it, so I'm going to savor it. Having less than half a bottle makes each ounce mean that much more, too. I'll let you guys know what I think after I drink some this weekend. Wow. How much of that cost was the packaging? In other news, sometimes it pays to ask. Discussing with the old gentleman at my local Froogal's the finer qualities of Blanton's vs. Jefferson's, and saw they had Pappy Van Winkle 10 yr out. Pretty rare, so that was cool. I knew they got Pappy stuff so I asked them if there was an e-mail list or something I could get on when they obtained 15-, 20-, or 25-year PVW since there's no set time (or amount). "Oh. Let me check the back." SCOOOORE!!! One of two they had left after a mere one week period of time, without even stocking it on the floor! I also got on a phone list for future shipments. Oh, and I snagged a bottle of Blanton's. Yeah, good day today. I agree with most of your stuff other than this. Glenlivet to me is a very nice tasting drink without being too harsh. And I envy you on your Macallan! I recommend exercising restraint. Sorry IRC people. The Glenlivet is the one I wasn't too sure about, since I tried it so long ago and only had 2 back to back glasses. It was about 7 years ago, so I really shouldn't have even mentioned it, but I figured any info (even wrong info) would help people form ideas on what they're looking for. I think I might try it, again, sooner than later upon your description of it. It sounds like exactly what I like to drink, so it's on my list. If I remember it was pretty cheap at $35 or so a bottle, so even if I still don't like it, it's no big loss. And thanks for the envy. I haven't tried the 25, yet, since I'm waiting for a couple friends to come out. I was drinking some 12 yesterday just staring at the 25 sitting on the counter. I want to crack into it so much, but patience. Patience. I'm not much of a whiskey drinker at all. The only whiskey I even consider is Jameson. The only time I drink it is if beer isn't doing it while I'm at the bar. I'll get a shot of Jameson and a beer and sip on the Jameson between drinks. But, I was at the local liquor store last night and saw a bottle of Buffalo Trace behind the counter. It stood out from the crowd and stared me down while I was ringing out, so I think it's calling to me. I didn't buy it, then, but you guys have put the seed in my brain and I think I'm going to break down and try it soon. Enablers. Okay, I'm gonna catch hell for this, I'm sure. 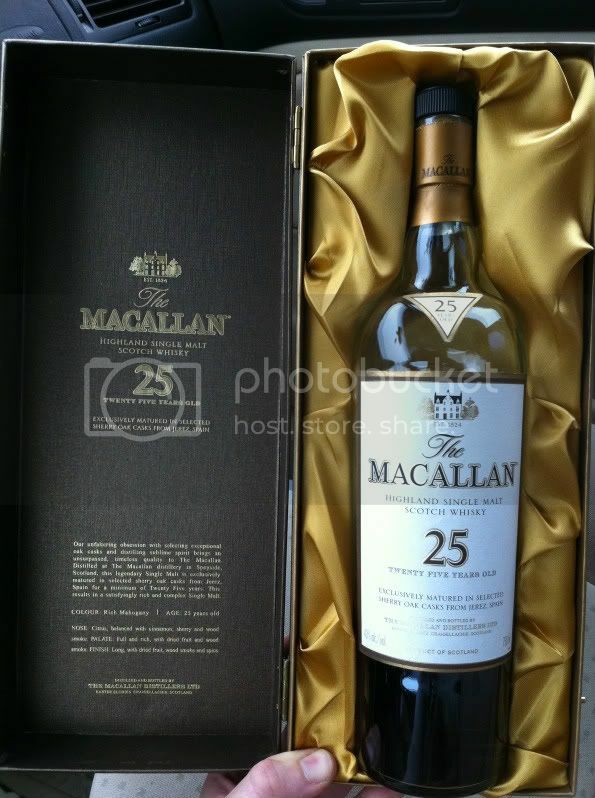 But, the difference between 12 year old Macallan and 25 year old Macallan is so subtle that I could never justify paying $400-$700 for a bottle. It doesn't even taste better, just slightly different. I was excited for it to be a whole new experience for my mouth and mind, but it really just....wasn't. I feel like I should just make something up and say, "This is the best scotch I've ever tasted and nyah nyah poo poo!" But, really it's just... Macallan. Mind you, that is not a bad thing at all. I'll gladly save $450 and go with 12 year. But, I can say I drank it and that makes me immeasurably happy. Life is all about the experience, right? Unless, with it being opened, it had already had it's contents 'switched out' for the 12 year old variety. Had a glass of Buffalo Trace on the back deck at the end of what was the best day of the year, weather-wise. Lovely. Had some friends over last night and we tucked into a bottle of Jack Daniels Single Barrel. The nose on that stuff could peel paint, but it was pretty tasty and somewhat smooth going down, with very little burn. Reactions all round were pretty positive, though we were all a few beers in by time we busted out the Jack. I've still got a good bit left, so I'm looking forward to giving it a taste test without anything interfering with my palate.